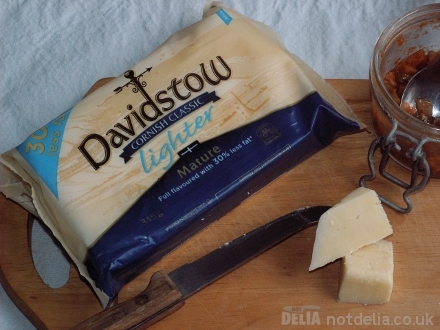 Here at Not Delia, we have already had a couple of Davidstow’s Cheddars to enjoy, and here’s another one. This time it is lighter. I quote: “Davidstow Goes Lighter for Summer”. Given the global nature of this website, I guess they assume, rightly, that it is always summer somewhere. On a personal note, the fact that it has 30% less saturated fat passes me by, but that fact may well be of interest to some of you. I am more interested in taste, and I must confess I was surprised. Pleasantly surprised. I expected bland, and I was wrong. As a lover of strong cheese, preferably with lots of blue bits and the odd maggot, I was surprised to find that this lighter cheddar actually had taste. I used this cheese to make a great, creamy, succulent lasagne. It grates easily. I also used it to make a sauce for my home-grown cauliflower. I love cauliflower cheese, and it worked. So are there any negatives? Well, perhaps a couple. According to the press release, “Davidstow Cornish Classic Lighter is available exclusively in Tesco.” So the global availability is dependent on the global reach of Tesco. And the packaging – well we all know how useless resealable tabs are, and this one is no different. That takes nothing away from the cheese!